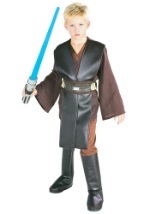 Take out Obi-Wan Kenobi's Jedi master in this kids Phantom Menace Darth Maul costume. The kids Darth Maul costume comes with a hooded 100% polyester shirt which ties in the back, pants with a stretchy elastic waist and a realistic PVC ½ mask. Add a pair of Darth Vader kids gloves and you're sure to wield your lightsaber like a pro!